Come explore! Let’s start an adventure with Lonely Planet Kids, with books that excite and educate children about the amazing world around them. We’ve got a bundle of all these books to give away to our wonderful readers courtesy of this wonderful kids’ book company. Why wouldn’t you enter today? Out this autumn, Lonely Planet Kids have five incredible new books that aim to inspire children about the world and what can be found within it. Travel back 200 million years to the days of the dinosaurs, meet over 100 fascinating animals from across the globe, discover how earth, air, fire and water shaped the globe, step into the world’s greatest little museum – in book form! – and explore the incredible world of animal architects. Combining astonishing facts, quirky humour and eye-catching imagery, these books draw on Lonely Planet’s huge team of global experts to help share what makes the world such a diverse and special place, and ignite curiosity amongst readers to discover more. Meet more than 100 fascinating animals from across the globe and see the remarkable ways we interact with them. This new book takes a walk through the wild side of every continent on earth, featuring creatures from the majestic grey wolf to the humble pigeon. Each page is packed with incredible facts and stunning photographs and illustrations, and also explores how you can learn to help protect wildlife and the planet. Travel back over 200 million years to discover a time when dinosaurs roamed the earth. This action-packed book features unfolding maps and flaps to lift to reveal amazing facts and how, where and when dinosaurs lived and how to discover more about the people who unearthed them! Learn how the the world was shaped by earth, fire, air and water, creating everything we see today. Packed with amazing facts, stunning photography and illustrations, The Big Earth Book explores the world around us in science, history, geography and the environment, taking a whirlwind tour of the past, present and future of our planet! Welcome to the world’s greatest little museum – in book form. 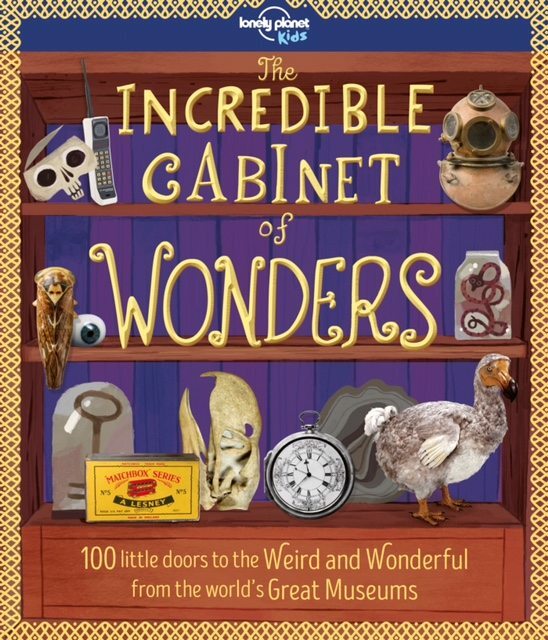 Selecting the strangest, weirdest and, above all, most fascinating objects from some of the world’s leading museums, this engaging book is great for discovering the wonderful world of museums. Presented in themed cabinets, from monster hunters to archaeologists, turn the pages and lift the flaps to discover these amazing treasures and read their fascinating stories. Animals are amazing architects – lift the flaps and open gatefolds to discover amazing animal homes in this new book from Lonely Planet Kids. From spider’s webs to rabbit warrens, discover extraordinary structures on land and under the sea, and discover how they’re built, whether up high or underground. All you need to do to enter, is to full out the Gleam widget below, and you are away. And, of course, if you share your unique link and more people enter the competition, then you can gain even more entries to the giveaway for yourself. 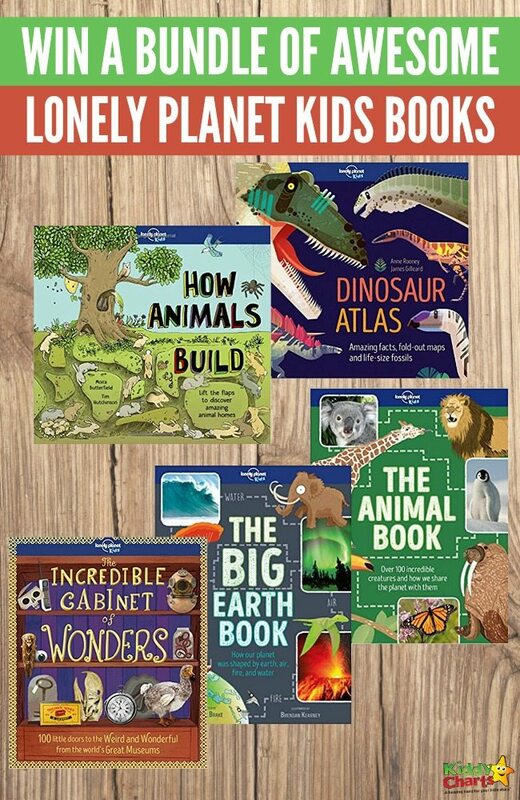 Win bundle of Lonely Planet kids books! This competition closes on Thursday 9th November at 11.59pm, and is open to the U.K. and Ireland only. All our standard terms and conditions apply as well. Do pop on over and check out all the other amazing giveaways that we have – always something for everyone! Secrets of the Nile would appeal to my son. My little boy wants to be an astronaut so he would love how to be a space explorer. Real Wonders of the World. Such a lot to learn & so many questions. Our 8 year old girly would love this. How Cities Work would really thrill my son as we live in the countryside! The Big Earth Book looks great!! 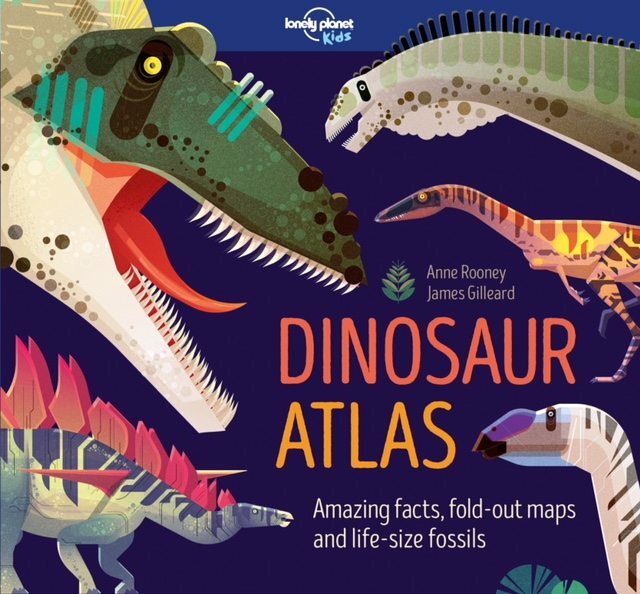 dinosaur atlas – awesome book. i wonder if kids 65 million years from now will still like dinosaurs?!!! i;m sure they will! The Amazing World Atlas For Children looks great! Pop Up London looks great so many nice ones. The World Atlas looks like a great reference book. The family travel map as we are a family that loves travel. World Search – Busy Places is my favourite, my son Leonidas would absolutely love it! My son would love “How to be an international spy” as he views himself as being an 8 year old James Bond and regularly spies on his brother to see what he is up to. The Backyard explorer looks a good one too! The World Atlas looks like a very interesting and useful book for children. The Backyard Explorer because it reminds you that you can have adventures on your own doorstep without having to go too far. My nieces and nephews would enjoy the Backyard Explorer. We like the ‘Let’s Explore …. Desert, Mountains and City books. Backyard Explorer is my favourite! I would have loved a book like this when I was younger, I absolutely adored being out in the garden finding bugs and digging holes! We love the Lonely Planet Kids World Atlas it really is interesting informative and brings the world to life through beautiful pictures and articles on each county and how exciting our planet truly is I would recommend it for any age group it is a treasure. We love to travel as a family and Lonely Planet really does promote family friendly travel without the fuss. Secrets of the Nile looks fab! At the moment Dinosaur Atlas,but changes can be made without notice. My daughter would love the family travel map as she and her daddy love travelling and learning about new places. Would love to win..my son loves animals and dinsouras. This would be a fantastic prize, fingers cross. The Backyard Explorers – I do believe that we look at things away from our own area and forget all the treasures of what is on our doorstep. I would pick out the Boredom Buster book for my niece. My favourite is the ‘How Animals Build’ book! It has beautiful illustrations and helps to explain the workings of nature to children! Let’s Explore… Jungle looks fabulous! How Cities Work looks like a book that my Grandchildren would really enjoy. Showing buildings from the ground up, and also showing what’s happening right under their feet like subways and sewage systems. Those sorts of things can be quite difficult to imagine, seeing it in a book would help them to understand I think. The Dinosaur Atlas as my son is obsessed with dinosaurs! The Incredible Cabinet of Wonders. We all love museums & the treasure you see in them. It’s great to learn wher they came from & history attacyhed to them. Maze mission looks perfect for my two boys, they love a challenge and adventure and we have done a few mazes together too! The Lets Explore City looks good. How cities work. The young family members adore it. We have Spot the Lot! at home and my children love taking it with us whenever we go on a trip. Pop up New York is brilliant! The Incredible Cabinet of Wonders looks really interesting for me as well as my granddaughter. The Boredom buster book as it will keep them quiet on car journeys. We like The Amazing World Atlas For Children. Great fun and very educational. How to be a dinosaur hunter looks good! I like the Big Earth Book, it sounds fascinating, would love to teach my son about the world. The Big Earth Book because it has amazing facts, photography, and illustrations that bring our planet and its past to life in an exciting, engaging way. I would love to get the “My Family Travel Map” title. We love travel but don’t get to do as much as we’d like so this would be a good home-based companion. I like World Search – Amazing Jobs the best. They all look fantastic, particularly The big earth book! I like the lets explore the ocean book as I think my daughter would love it. 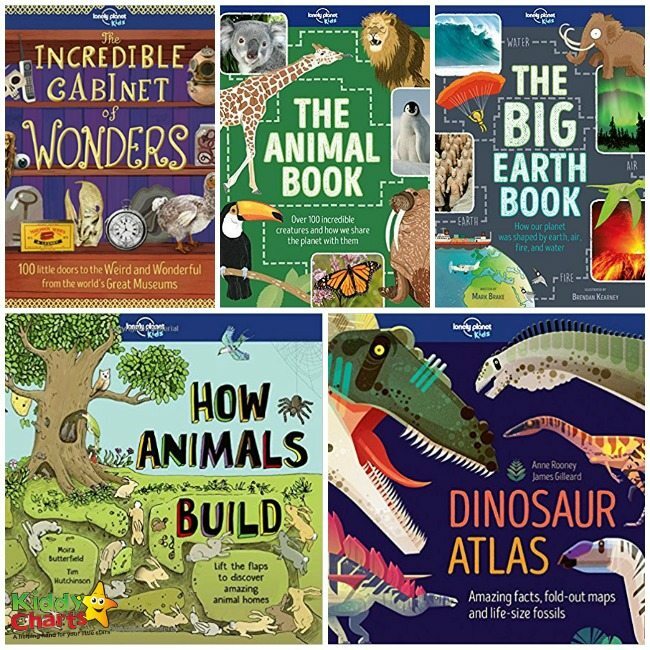 I know my daughter would love the World Search – Incredible Animals book as she adores all animals and wants to work as a vet when she is older and also visit some animal sanctuary’s abroad to help out!